Powerful and robust - this shredder is truly Mighty. Mighty Mac has a reputation for building sturdy machines that making hard gardening tasks easier. The LSC1100EX lives up to that tradition, providing a high performance solution to leaves and garden waste disposal. Powered by a Briggs & Stratton 249cc OHV engine, this machine truly lives up to the Mighty name. 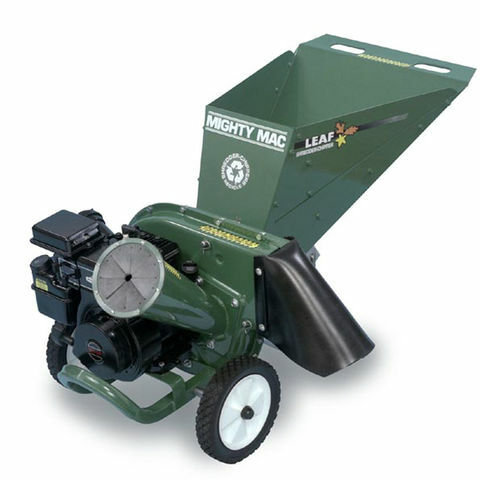 A large hopper allows you to feed plant waste, grass trimmings and leaves into the shredder - which reduces leaves to 1/8th the original size. Far from just a shredder, the LSC functions as a chipper for branch cuttings and off-shoots - producing perfect results on branches up to 5cm in diameter. Easily movable thanks to sturdy 10 inch tires, the LSC is perfect for tidying garden waste in the Autumn and Winter, and even better for producing rich chippings and shreddings for grass growth in the Summer - giving your lawn that perfect green glow. The LSC1100EX comes with a two year consumer warranty.